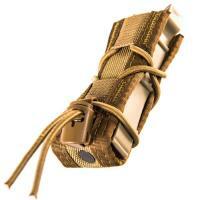 The Pistol TACO LT MOLLE Magazine Pouch from High Speed Gear is a lightweight version of the original magazine pouch. New construction techniques and materials make the pouch 30-percent lighter and much more flexible, without losing any of the durability that makes High Speed Gear's TACO so popular. The pouch provides space for most pistol magazines, multitools, duty lights or knives. The adjustable shock-cord lacing stretches to fit and offer active retention of contents without compromising quick access. The TACO LT includes a set of HSGI® clips for easy attachment to PALS-webbing, making it compatible with a wide range of tactical gear and accessories.